A church in Wales, which recently marked its centenary with a Mass celebrated by the Bishop of Wrexham, Peter Brignall, is to close in February, he has announced. 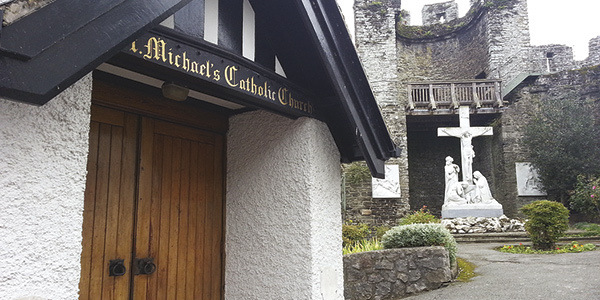 Parishioners at St Michael & All Angels Church in Conwy spoke of their “devastation” after a letter was read out, the weekend before Christmas, announcing the last Mass would take place there on 11 February. Parishioners have said the announcement marred their Christmas and they are preparing to appeal the decision under canon law. In the letter that was read out, Bishop Brignall argued that “re-structuring of parishes and closure of churches” would ensure Mass could be celebrated in each remaining church every Sunday – but also warned of further pain: “This process is not yet complete and there are more closures to come as needs demand.” He has previously announced plans to close around 20 of Wrexham diocese’s 62 churches by 2020. The church boasts a unique set of Stations of the Cross, 13 of which are built into the historic Conwy walls. Grade II listed, they’re the work of an Italian architect, Giuseppe Rinvolucri, who came to Wales originally as a prisoner of war.